Pre-order bonuses for video games are met with a lot of backlash, and rightfully so. Withholding content from people who pay for a game unless they committed their money to it before it’s released and before knowing if the game is any good or even works is just one of the many current trends doing damage to games as we know them. Often the pre-order bonus is a non-essential in-game item or items, but sometimes it’s a significant thing such as the Behemoth monster in Evolve, which would cost you $15 as DLC unless you pre-ordered despite already shelling out $60 for a multiplayer-only game. One of the reasons I and many others sadly had to pass on the game. Just Cause 3, the insane looking open-world sandbox game with a focus on destruction and mayhem, is also offering a pre-order bonus. But this is a pre-order bonus done right. 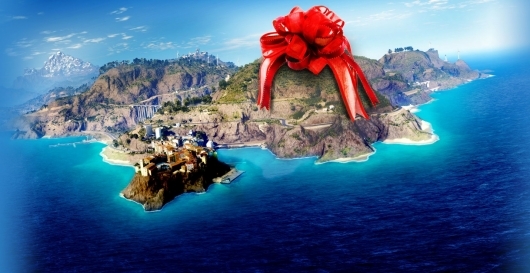 If you secure a copy of the Day One Edition of the game, you’ll be able to compete to win your very own island. Yes, a real island. More information below, as well as a video. Just make sure you get a copy marked “Day One Edition or it won’t come with the code needed. The pre-order also comes with the aforementioned non-essential digital items in the form of three weaponized vehicles, and the Xbox One version comes with a digital copy of Just Cause 2 as well. You can pre-order it for Xbox One and PS4 at those links or wherever you usually buy your games. How nice will this island be? Who knows. I’m assuming you’re not going to be the next Richard Branson or anything. But, most importantly, you’ll be able to say THIS to everyone you meet forever and ever.